Tag Archives: Cutler & Co.
the gushworthy Cutler & Co.
A personal, intimate celebration was in order after a very special milestone had been passed. Thus, my partner and I decided to dine at Cutler & Co. one evening. This was some weeks ago now and I can’t stop thinking about it. In fact, I feel like Bubbles from The Wire but instead of concocting schemes to fund my next hit, it’s to fund another visit there to splurge on oysters and cocktails. I am still very much enamoured. A hospitality friend of mine told me the degustation was essential dining, and so both myself and partner put our trust in this recommendation. To begin, we sipped on gin and tonics – you are given a glass with gin, ice cubes and a lemon wedge. 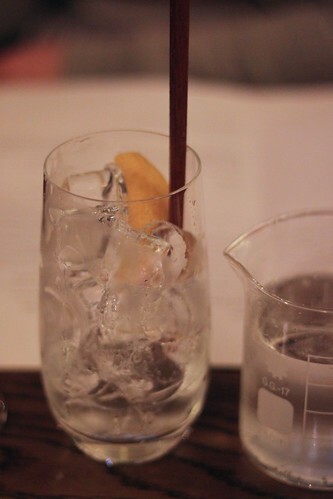 A separate science-lab-style beaker with tonic is provided and you mix the gin and tonic with a chopstick in the glass. 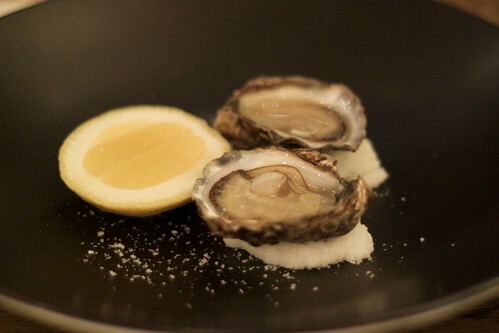 After our dietary requirements were confirmed, the first appetiser served was delicate Clair de Lune oysters. I don’t know much about oysters but when I’ve had them at most places, the shell is about the size of my palm. These ones were about half that size, and the shells were much more rounded. The next appetiser was morsels of slow cooked octopus topped with various things most carefully. I closed my eyes and chewed slowly to savour these as long as possible and enjoy the amalgam of flavours. Just joyous. 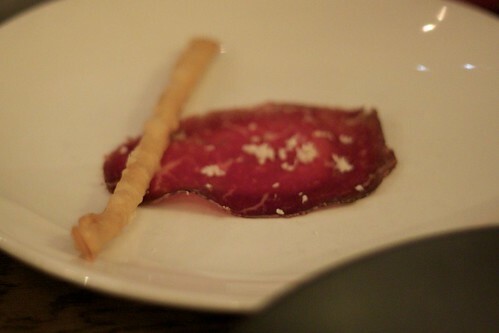 The last of the appetisers was a slice of air cured wagyu which you are then meant to wrap around a thin pastry straw modelled on the humble cheese straw. These pastry straws had wasabi in them. One did not seem enough. 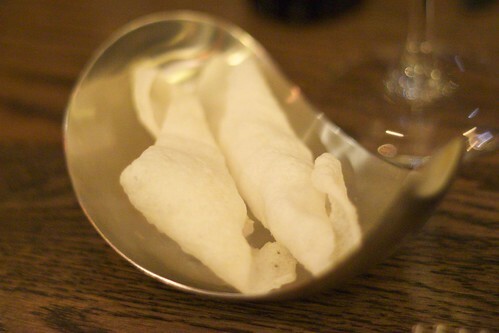 As well as your choice of warm sourdough or rye bread, you get these whisper-thin parmesan crackers that are made to look like prawn crackers. You know the ones – those ones that melt as soon as they make contact with your tongue. Very sophisticated, but still playful. At this stage, I should mention that just how accommodating the staff were became supremely evident to me. Very tentatively, I asked if it would be possible that instead of both of us having full glasses of wines matched to the course, would it be an option for us to have half glasses. Our waiter and sommelier Ben said that was perfectly okay. This really quite impressed me. 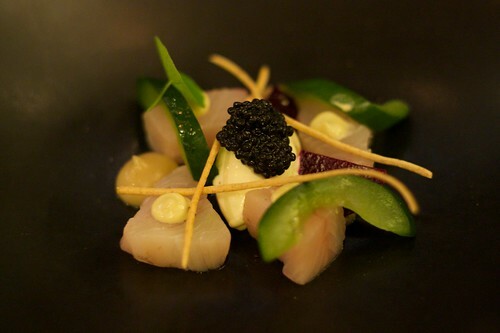 ‘Serious’ business can now begin: our tastebuds had been flirted with quite tantalisingly, and the first of the dishes was to be served: an arrangement of cured kingfish, smoked onion, seaweed vinegar, beetroot and rye. It’s composed so carefully on the plate that it seems a shame to begin demolishing it. The accompanying wine was a 2009 KT & The Falcon ‘Peglidis Vineyard’ riesling. I’m not a massive fan of riesling, and you know why? I clearly haven’t had enough superlative examples of the style. Normally I find them too sweet and cloying, but this one was fairly dry. 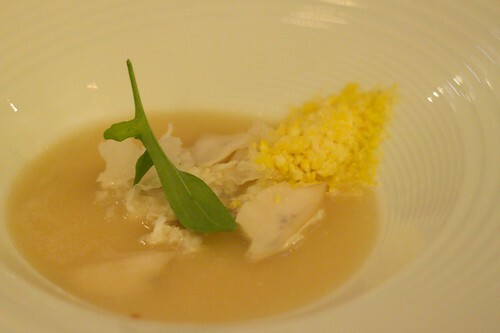 The next course was a soup one – we were presented with plates of spanner crab, abalone and sweet corn. A soup of white onion was then carefully poured into the scallopped bowl. The crumbly sweet corn was chilly and because of that, I expected the soup to be like that too, but it was surprisingly warm. 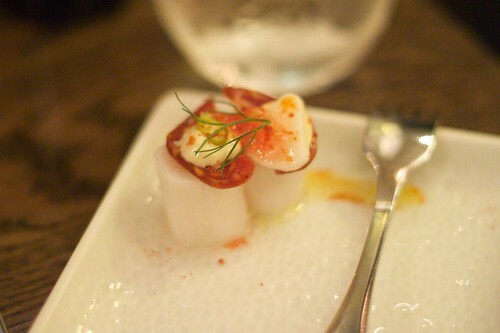 Every mouthful kept me guessing with its subtle flavours and unexpected textures. To match, the 2008 Sutton Grange Syrah viognier rose was served. With hardly a hint of pink in its colour, this wine tasted as understated as it appeared initially. The flavour gradually developed as one drank more of it. 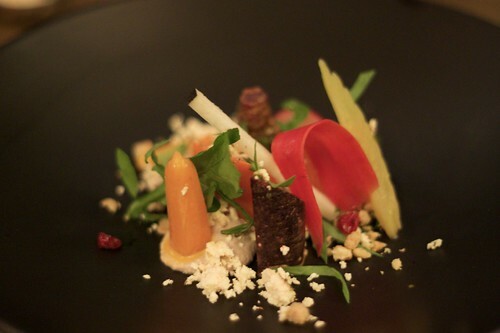 The last of the lighter courses was a raw, cooked and pickled carrot salad with walnut cream and shanklish. When one of the waitresses asked me which of the courses thus far was my favourite, I said that while I couldn’t pick one, I could confirm this as my least favourite though singling it out felt like quite the crime. At this stage, we were supposed to be served the Romante ‘Regente’ palo cortado – a gorgeous dry, delicately nutty sherry that our waiter said was a bit of a gamble – he said that we’d either hate it or love it. This was my favourite alcoholic pick for the evening – I wanted to take the entire bottle home, cradle it and slurp it up. This sherry wasn’t actually served with the dish as intended and the sommelier was visibly annoyed by miscalculating the number of dishes we were up to. He insisted we drink this delightful number with compliments of the restaurant. Neither myself nor partner were at all put out by the supposed mistake. This was coupled with the 2008 Hoddles Creek pinot noir and I had trouble drinking it in a restrained manner. 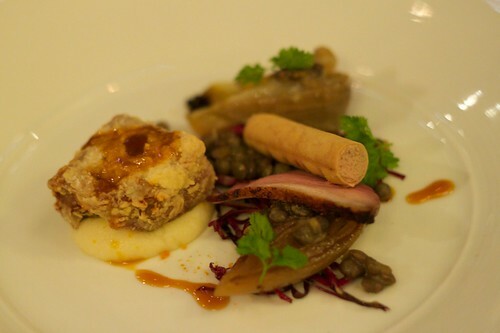 An excellent complement to the dish as it didn’t compete in flavour with the duck but rather augmented it. 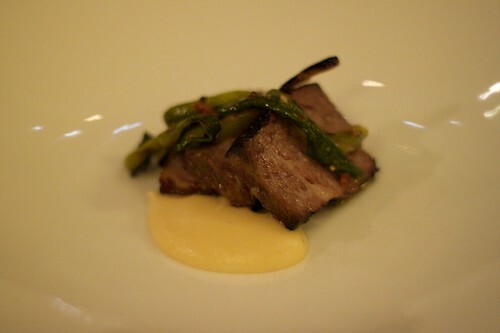 Oh the red meat course of wood grilled Rangers Valley short rib. Melt-in-your-mouth beef with the perfect amount of fat marbled through the meat. As I ate this, my mind constantly chanted “savour, Gem, savour, chew slowly“. At this stage I shall have to admit that I don’t remember as much about the 2007 Domaine Darnaud ‘La Vendeima’ St Joseph shiraz served as I’d like. Up to this point, many of the wines had a very similar mouthfeel – light, thin, crisp (yes, even the pinot). The shiraz was naturally fuller in body. 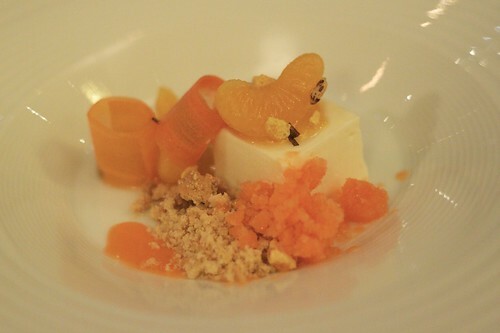 Now to begin the dessert stages with a edible sculpture of sheep’s milk yoghurt, carrot granita and mandarin. The yoghurt possesses no sour taste and is silky. This course on the whole is not too sweet, and that makes it all the more pleasing. The accompanying wine was the 2008 Pegasus Bay ‘Aria’ riesling which was sweet but not too sticky and ever so slightly syrupy in mouthfeel. 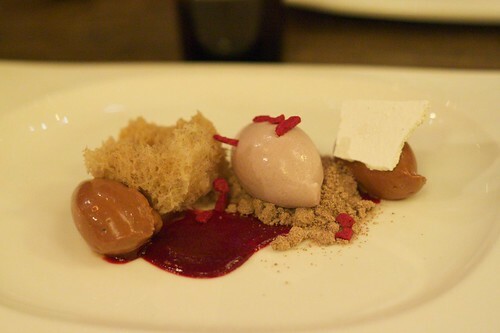 I’d managed to be on my best behaviour this far but when the violet ice cream, chocolate ganache and sour cherry ending to the meal was presented, I scoffed it down pretty quickly. It was bursts of not too sweet, pucker-mouth-sour and tart and creamy goodness. I judge it to be the dish that will unleash your child-like glee. The closing alcoholic beverage was the Mas Amiel ’10 ans d’age’ – a tawny port-like experience. As to be expected, we were presented with petit fours and I opted to have Earl Grey tea which came in a hefty iron pot. Upon settling the account, as we left, we were politely asked if we needed a taxi to be called for us. Our sommelier Ben was kind enough to print out a list of our courses and matching wines upon request for us to take home. 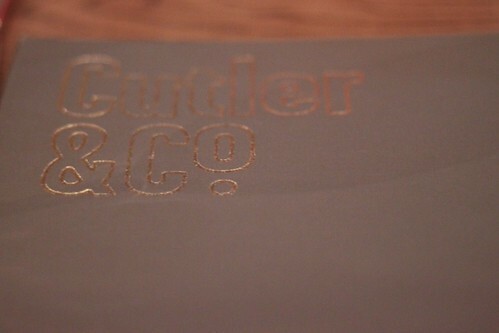 Everything about Cutler & Co. speaks refined, polished and yet not one bit intimidating. Your experience starts as soon as you enter the door and I’m awed by how seamless the service is – they really make you feel like you’re the only person they are looking after. Absolutely recommended for special occasions when you want to be fussed over. Weeks after my first time there, I am still gushing in earnest. edit (16/2/2016): Belinda from OpenTable suggested I add an online link to make bookings to the restaurant which is pretty useful info so I’ll include one. Please note that I do not receive any gratuities for doing this and cling to the naive belief that it might be helpful, honest! This entry was posted in eatie-foodies dining out and tagged Cutler & Co., Fitzroy, matched wine dinners, Melbourne, modern Australian cuisine on July 5, 2010 by gem.